Senate Majority Leader Mitch McConnell said that he doesn't think there is "any chance that the Mueller investigation will not be allowed to finish," after Acting Attorney General Matthew Whitaker took charge of the investigation on Wednesday. Many Democrats and some Republicans raised concerns after Attorney General Jeff Sessions resigned under pressure, and oversight of the probe passed from Deputy Attorney General Rod Rosenstein, that Special Counsel Robert Mueller would be hindered in conducting his investigation into Russian meddling in the 2016 election. "The President has said on multiple occasions the Mueller investigation should be completed. He wish it would happen sooner. 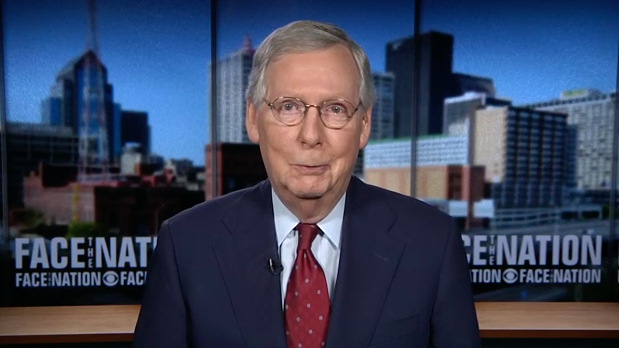 But I don't think there's any chance that the Mueller investigation will not be allowed to finish," McConnell told WVLK in an interview Thursday. President Trump had repeatedly unloaded on Sessions for recusing himself from the Russia investigation, which allowed Rosenstein to appoint Mueller. The president promptly ousted Sessions after the midterm elections on Tuesday. "It's pretty clear the president wanted to make a change and it occurred after the election. We'll see who he sends up. But I think any president should be given a lot of latitude on picking his own team," McConnell said. He added that he was sure whomever Mr. Trump nominated to replace Sessions would be "somebody who will be able to get confirmed." Several contenders are reportedly under consideration to replace Sessions, such as Mr. Trump's personal lawyer Rudy Giuliani, former New Jersey Governor Chris Christie and Florida Attorney General Pam Bondi. Christie visited the White House Thursday and met with Mr. Trump's son-in-law and top aide Jared Kushner, whose father he sent to prison while Christie was a U.S. attorney. New York Rep. Jerry Nadler, who's likely to be the next House Judiciary Committee Chairman, said in a statement on Wednesday that he would investigate Sessions' dismissal. "The American people understand that no person is above the law and have demanded accountability from their government. The firing of Jeff Sessions will be investigated and people will be held accountable. This must begin immediately, and if not, then a Democratic Congress will make this a priority in January," Nadler said. On Thursday, Nadler called on current Judiciary Chairman Rep. Bob Goodlatte, a Republican from Virginia, to open an investigation into Sessions' departure. He and his Senate counterpart, California Democrat Sen. Dianne Feinstein, also asked for preservation of all records related to the special counsel and the attorney general.